British Cycling organise races and events for all level of rider, in pretty much every kind of discipline. Recently, there have (thankfully!) been more events catering specifically for women but due to a multitude of reasons, uptake of these events isn’t always as high as it could be. Ladies, we need to change this! It’s not often that I feel genuinely disappointed that I’m a woman, but when talking to a British Cycling coach on Sunday, that’s exactly how I felt. We were at a women’s regional road race training session and our coach was asking us how we felt about the fact we’re just lumped in as an afterthought with all the Cat 4 men, and speaking about the lack of opportunities for women to race against each other. The problem is, there are so few women racing, that if you want to give it a go, you’ll most probably find yourself riding with women of every ability; from the super fast, to extremely green riders, well, that’s if you can find a women’s race at all. Maybe that’s why women don’t sign up to many races and why it’s proving hard to encourage us to do so? If you’re a novice male racer, you can have a go with other novices, there are bazillions of opportunities for you! 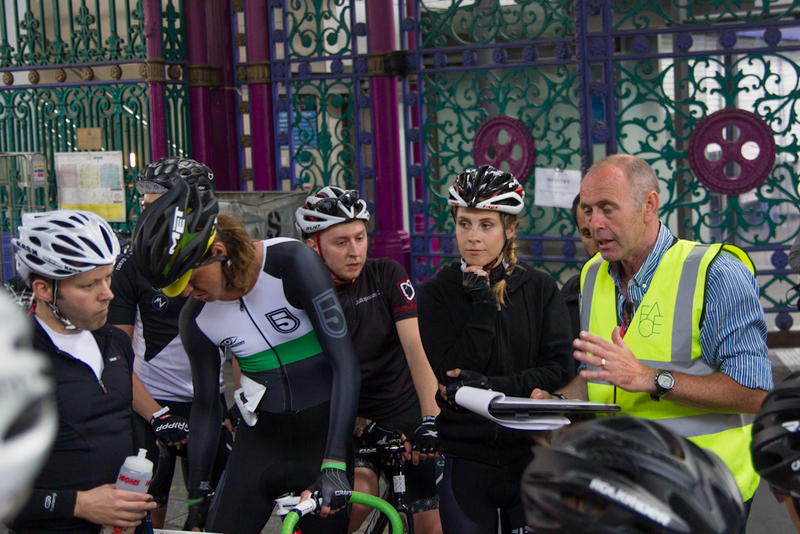 But if you’re a woman, you may well find yourself on the start line with elite female racers you’ve actually heard of. So basically if I was a guy, getting into racing bikes would be so much easier, and just generally more appealing. Gutted. Anyway, back to what I was originally writing about – regional road race training and what to expect. In an effort to reassure other women that these sessions are both manageable and enjoyable and perhaps encourage more women to give racing a try, I thought it would be useful to share exactly what might happen in a session. Our session on Sunday was held at Westpoint, near Exeter, a big closed road circuit which is kind of like an airfield. We were a mixed bunch; differing in age, ability and confidence, and all on rather different bikes – me on a cyclocross bike with road tyres, another lady on a steel machine, and some on higher end carbon cycles. We began by riding in a line around the circuit, the aim being to stay as close to the rear wheel of the person in front as you could; if you tuck yourself in close (about a wheel’s length away) you’ll save a lot of energy and be able to ride for longer, or sprint when you need to. Once we’d settled into things a little, we began a few exercises to get comfortable riding in close proximity to each other. First of all, we rode in pairs with a hand on each other’s shoulder, then we rode next to each other and tried to keep our elbows touching our partner’s. We did this all the way round the circuit, up and down the straights (easy) and around the corners (more difficult and prone to make you giggle). Next we got back in a straight line and practiced taking the lead then pulling away to the side before rejoining the group at the back after they’d passed you, the idea being that in a race you take your turn at the front for a bit whilst giving your team mates the opportunity to draft you and save energy, before you drop back to do the same. The next bit was the most enjoyable for me, as we got to go as fast as we could – the person at the front of the bunch had to sprint for 20 seconds then return to the original pace, at which point the next person has to sprint to catch them. This is repeated by each person in the bunch until everyone has caught the leader. We also went through the theory of cornering at speed, were given tips on riding on the drops, selecting the right gear and all sorts of other stuff to make things easier for ourselves. I bloody loved it! And I really want to try a race now. But more than that, I want other women to try it and love it. I know there are heaps of women out there who are interested, but perhaps nervous or unsure what to expect and the thing is, you’re not alone in feeling like that, but actually there’s very little to be frightened of. Also, the more you do something, the less scary it gets, so why not give it a crack, get that first, initial nerve racking experience out of the way, then you’ll be fine! Go on, I dare ya! Modern women don’t like to compete? They aren’t competitive in what they as male domains (so team sport, but to a lesser degree also at work). I don’t know why, I’ve encouraged female riders I know who are fast to try racing but the answer is always the same ‘Oh I don’t like competing’. Perhaps they are afraid of failure or just having to push hard in training, I don’t know. But it’s a conversation women interested in cycling need to have. Men aren’t the problem, it’s somewhere with you guys. I hear what you’re saying, in that yes, women need to step up to the plate to make a change, but my point is there are greater hurdles to nervous novice women than there are for men – a novice female will have to race with seasoned pros whereas a man can just join one of hundreds of cat 4 races with other newbies. Also, from an early age, women are inundated with images of glossy, retouched women, many of whom posses no talent whatsoever other than ‘looking good’ (if you can call that a talent) and unfortunately some girls grow up thinking that being attractive and having perfect hair is the most important thing in life. Contrast that with boys, who from childhood are often taught to admire footballers and other strong, talented sportspeople, and you can see that participating/competing in sports is not as natural a thing for women as it is for men. My husband and I both started racing this year. Living in London means I am lucky enough to have many woman only racing around. In my first race there were Cat 4 to Cat 1 racers. I found that having the experienced women there helped us newbies in what to do. They soon disappeared into the distance but did give some leadership to the start of the race. Since there were only 10-15 riders the group riding was controlled and widely spaced. I now know most woman who race in London. Contrast with the men Cat 4 race: 40 men all storming round the track cornering very close together. I’m Quite happy in my elite to cat 4 race thank you. I do agree that being lumped in with Cat 4 men is intimidating and would definitely put people off. Luckily the world of racing is starting to take note and are putting on more woman only races. Woman race training sessions and the general promotion of woman in cycling is having a great impact on getting woman cycling. There is a noticeable rise in woman cycling in London you just have to look at the demographic of cyclists at the lights. Hey, yeah I guess that maybe having a smaller number of women in the race would make things easier, even if they’re of mixed ability, that makes sense actually!